Will go over $500,000--How about it www.23andme.com? Sergey dig in your Google pockets and take this gold down! Or let Anne do it! Here's the description--You can buy it at HA.com. Francis H. C. Crick Nobel Prize Medal and Nobel Diploma. In 1962, Dr. Francis Harry Compton Crick received the Nobel Prize in Physiology or Medicine, along with Drs. James Dewey Watson and Maurice Hugh Frederick Wilkins, for "...their discoveries concerning the molecular structure of nucleic acids and its significance for information transfer in living material." It was a discovery that launched a scientific revolution and forever changed man's understanding of life. 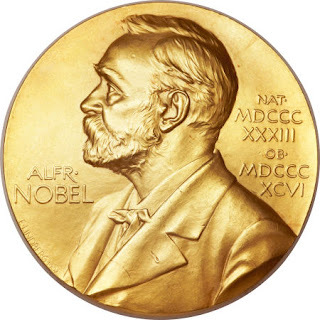 Swedish scientist Alfred Nobel (1833-1896) first established the Nobel Prize in 1895. Nobel, the inventor of dynamite, was condemned by the French press in 1888 following a false report that he had died (it was actually his brother) and, not wanting to be forever remembered as the "Merchant of Death" or the man who got "...rich by finding ways to kill more people faster...," he resolved to repair his legacy before it was too late. Using a portion of his last will and testament, he stated: "The whole of my remaining realizable estate shall be dealt with in the following way: the capital, invested in safe securities by my executors, shall constitute a fund, the interest on which shall be annually distributed in the form of prizes to those who, during the preceding year, shall have conferred the greatest benefit to mankind. The said interest shall be divided into five equal parts..." Those five parts are still represented today as the prizes for physics, chemistry, physiology or medicine, literature, and peace (the prize for economics did not appear until 1969). 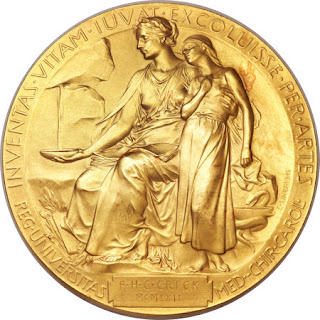 Each Nobel laureate is presented a medal, a personalized diploma, and a cash prize. This particular medal, designed by Swedish artist Erik Lindberg, measures 6.5 cm in diameter (approximately 2.5") and weighs 198.6 grams. Struck in 23 carat gold, the obverse features a side portrait of Alfred Nobel with the dates of his birth and death in Roman numerals. The reverse "...represents the Genius of Medicine holding an open book in her lap, collecting the water pouring out from a rock in order to quench a sick girl's thirst." An inscription appears above the figures, reading: "Inventas vitam juvat excoluisse per artes." Taken from the sixth song, verse 663, of Virgil's "Aeneid," it is translated as, "inventions enhance life which is beautified through art." The lower outside section of the medal bears a second inscription, "REG. UNIVERSITAS MED. CHIR. CAROL," the Karolinska Institutet (The Nobel Assembly at the Karolinska Institutet, one of the most esteemed medical universities in Europe, is responsible for choosing the laureates for the award for Physiology or Medicine). The initials of Crick are engraved in a plate below the figures along with the year of the prize, 1962, presented in Roman numerals: "F. H. C. Crick/MCMLXII." The medal is housed in an elegant, yet simple, red leather case with Crick's initials giltstamped on the top, surrounded by a decorative border, also in gilt. When open, the inside lip of both the top and bottom feature a giltstamped border. The medal rests securely in a fitted box of yellow velvet with satin lined top. The second piece of the Prize, the Nobel diploma, is also included. Two beautifully handwritten, vellum pages, 9.5" x 13.5", in Swedish, Stockholm, October 18, 1962. Until 1964, each diploma featured unique artwork designed by a Swedish artist, in this case, Bertha Svensson-Piehl. The art appears in the top half of the first page, showing a long-haired youth in a blue tunic and slippers holding the rod of Asclepius, framed by what appears to be a doorway. The diploma gives the name of the recipients (Crick's name appears above the others in red) and the reason why they have been selected to receive such a prestigious award. 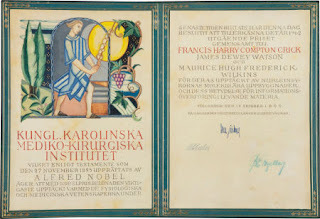 The diploma bears three signatures at the end, presumably members of the Nobel Foundation. 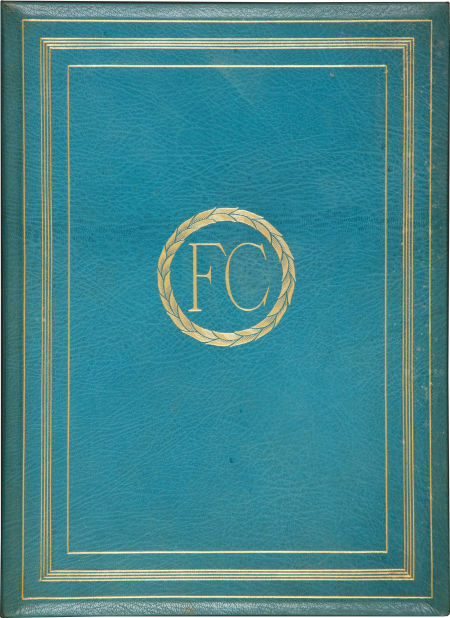 Mounted in a turquoise leather portfolio with decorative borders giltstamped on the front and rear covers, Crick's monogram appears in gilt on the front cover, surrounded by a wreath of laurels and the rear cover features a giltstamped rod of Asclepius. The diploma is detaching from the portfolio along the top edge of the first page and the right half and top edge of the second page. There are several scattered spots of foxing and light toning. Francis Harry Compton Crick (1916-2004) showed an aptitude toward science at an early age, receiving a Bachelor of Science in Physics from University College London at the age of 21. He pursued a Doctorate in Physics studying the viscosity of water at high temperatures, but his studies were derailed during the Second World War when, during the Blitz, a German bomb landed in his laboratory, destroying his equipment. He spent the rest of the war working for the British Admiralty designing acoustic and magnetic mines. In 1947, with a waning interest in physics, he embarked on the study of what he called "the border between living and the nonliving" - molecular biology. Having no knowledge of biology or organic chemistry, he had to begin from scratch, spending the first few years familiarizing himself with the subject. In 1949, he joined the Cavendish Laboratory at the University of Cambridge and, during this period, began working with X-ray diffraction and helical structures. Crick first met James D. Watson (b. 1928), a 23 year old American postdoctoral zoologist with a background in genetics, in 1951. Watson had become interested in the structural chemistry of nucleic acids and proteins and the two men, discovering a shared common goal of solving the molecular structure of deoxyribonucleic acid, or DNA, became close friends and partners. Using available X-ray crystallography data from Rosalind Franklin and Morris Wilkins at the King's lab in London, they attempted to build a model of DNA in late 1951, but the model was incorrect. In 1953, spurred on by the chemist Linus Pauling's published, but incorrect model of DNA, they made a second attempt. On February 28, 1953 they correctly concluded that the two parallel chains of the DNA double helix must run in opposite directions and that the complementary nucleotide bases pack into the core of the DNA double helix. This immediately suggested to them the method by which all life would be replicated. Shortly after their discovery, they entered Eagle Pub in Cambridge where, according to Watson, Crick enthusiastically declared they had "found the secret of life." Crick and Watson published their findings in a one-page paper in Nature on April 25, 1953, illustrated with a schematic drawing of the double helix by Crick's wife, Odile. They further developed their ideas about genetic replication in a second article in Nature, published on May 30, 1953. The two demonstrated that double-helix could both produce an exact copy of itself and carry genetic instructions. Crick went on to elaborate on the implications of the double-helical model, advancing the revolutionary hypothesis, widely accepted now; that the sequence of the bases in DNA forms the code by which genetic information can be stored and transmitted. Dr. Francis Crick, alongside Drs. Watson and Wilkins, received his Nobel Prize from the hand of King Gustav VI Adolf of Sweden at the Stockholm Concert Hall on December 10, 1962. Professor A. Engström, a member of the staff of the Karolinska Institute who presented the men with their award, summed up the impact of their discovery during his presentation speech: "Today no one can really ascertain the consequences of this new exact knowledge of the mechanisms of heredity. We can foresee new possibilities to conquer disease and to gain better knowledge of the interaction of heredity and environment and a greater understanding for the mechanisms of the origin of life...Your discovery of the molecular structure of [DNA], the substance carrying the heredity, is of utmost importance for our understanding of one of the most vital biological processes. Practically all the scientific disciplines in the life sciences have felt the great impact of your discovery. The formulation of double helical structure of the deoxyribonucleic acid with the specific pairing of the organic bases, opens the most spectacular possibilities for the unravelling of the details of the control and transfer of genetic information."